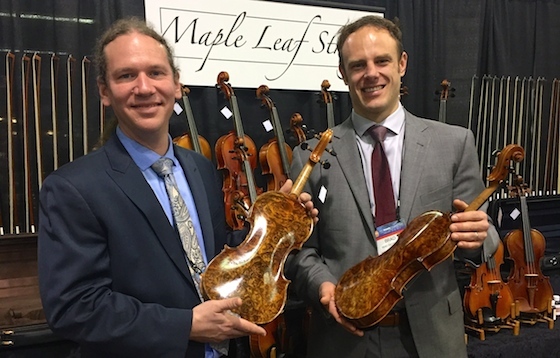 January 20, 2017, 1:31 PM · Electric Violins, Octave Strings, a 3D-printed fiddle, a new kind of Manhasset stand -- these were a few of the innovations I found Thursday at the annual NAMM Show in Anaheim, Calif. The show is a giant gathering of the National Association of Music Merchants -- expected to attract more than 100,000 people and 1,600 exhibitors. I first dropped by what I would call Yamahaland -- Yamaha has so many products that it holds its displays in the Marriott Hotel, adjacent Anaheim Convention Center, which houses all the other merchants. Yamaha Music's stringed instrument division was celebrating the 20th anniversary of the first Yamaha electric violin, the Silent Violin, with a new model (the YSV-104) which goes back to the idea of the instrument as mostly a practice instrument, used with headphones. One fun thing about NAMM is the fact that it attracts so many musicians -- you just might see someone you know, or that you know of. 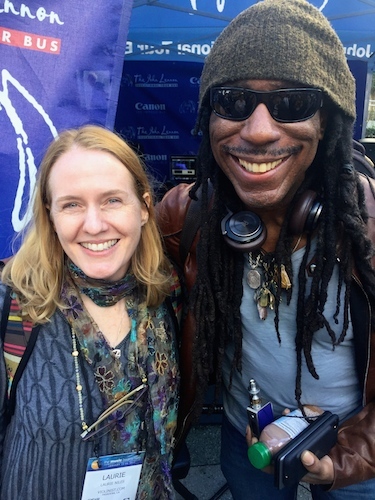 I've always been a fan of the Dave Matthews Band, so I was happy to get the chance to meet its violinist, Boyd Tinsley, who recently formed a new band called Crystal Garden. Laurie with DMB violinist Boyd Tinsley. Laurie and Jesus Florido by the Lennon Bus. On my way out, I caught a glimpse of something familiar: The Manhasset music stand booth. I have a Manhasset music stand, but it doesn't look like this! Decorative, and a little wider than the regular stand, they had designs with other instruments as well as this violin design. I want one! They must be very new, as I can't find them online anywhere! So, presumably you could play a string quartet with two violins and two violas (or, as suggested in the video, a five string violin if you're going electric)? That's pretty neat, as you could round up four violinists and do it, the biggest barrier being learning to read bass clef. January 21, 2017 at 07:12 AM · To be honest, I'd never heard of them before, either! January 21, 2017 at 08:34 PM · "The first 3D printed violin" IS IT? http://www.violinist.com/discussion/response.cfm?ID=24976, posted over 3 years ago. January 21, 2017 at 08:42 PM · And the Octave G string could be what's needed for the F-string of that 6 string viola that's advertised (I'm not sure whether the violin or viola string would be best). January 21, 2017 at 09:08 PM · Violist's have that eternal dilemma between a viola large enough to yield a rich C string and one small enough to be comfortable to play. You'd need to understand that just putting octave strings on a violin likely won't yield an instrument capable of richly amplifying those low tones. Also, do those octave strings require enlarged string notches at the nut? If so that's a one way street, and you would have to replace the nut to go back to normal tuning. It seems to me that octave strings are a concept mostly suitable for electric violins. If someone finds out that's not true, please do let us know. By the way, if you are amplifying your violin and want lower (or higher) pitches, there are electronic devices that can do that. I've used an EHX Micro POG (Polyphonic Octave Generator) before, with pleasing results. January 22, 2017 at 07:18 PM · I just looked up the price -- $71.50, from D'Addario. January 22, 2017 at 07:21 PM · John, good point about the 3D fiddle from three years ago -- I'm thinking there is probably some kind of distinction; it appears to me that the "3Dvarius" is 100 percent printed, and perhaps the other is only partially? January 23, 2017 at 03:35 AM · Re: Octave strings: I have an Oktavgeige (octave violin) by Johann Reiter (the last one carved by him, but assembled by his apprentice Erik Sandner after Reiter's death, when Sandner took over Reiter's shop.) The original Oktavgeige strings were by Otto Infeld, but apparently they no longer make them. Perhaps I can use these. My Oktavgeige has the length and width of a 16" viola, but the depth is that of a proportionately sized mini cello. It BARELY fits under the chin with no chin rest (well, actually a thin strip of wood just to protect the top from pressure and sweat). January 24, 2017 at 05:26 AM · Laurie, I read the article you referenced (linked) about the making of the 3Dvarius violin and learned that the no. 1 model is named Pauline. Should I be happy about this?